High above Brown Tongue, Wasdale, Claude Deane Frankland had just finished leading his route on Scafell and was belaying his second up to join him. Not far away, two other climbers were completing the final section of Keswick Brothers’ Climb (Very Difficult) and caught sight of C.D. Frankland. Intrigued to see another partnership they approached to ask which route they were on. C.D. Frankland timed his response perfectly and informed the two gentleman that they were in fact on Central Buttress (E1 5b), just as his climbing partner and Fell and Rock Climbing Club member, Mabel Barker, appeared next to him. “There are moments when it is rather good fun to be a woman. Probably no lady in history was ever so sure of creating a mild sensation by the mere fact of being where she was." Mabel Barker and C.D. Frankland had just achieved the fourth ascent of Central Buttress which was also the first female ascent. This was in 1925, when female climbers were few and far between in the UK rock climbing scene. During this climb Mabel Barker was also responsible for leading the Great Flake pitch, which now goes direct at E3 5c after the loss of the crucial chockstone in 1994 (there is still an E1 variation by climbing the face of the flake). Ivan Waller remembers attempting the Central Buttress a few years later: “if a woman had climbed it surely we could.” However, climbing with Michael de Sclincourt, the two men discovered it to be far harder than they anticipated, and fell from the Great Flake pitch whilst stood on each other’s shoulders, leaving Ivan hanging below The Oval and their reputation bruised. 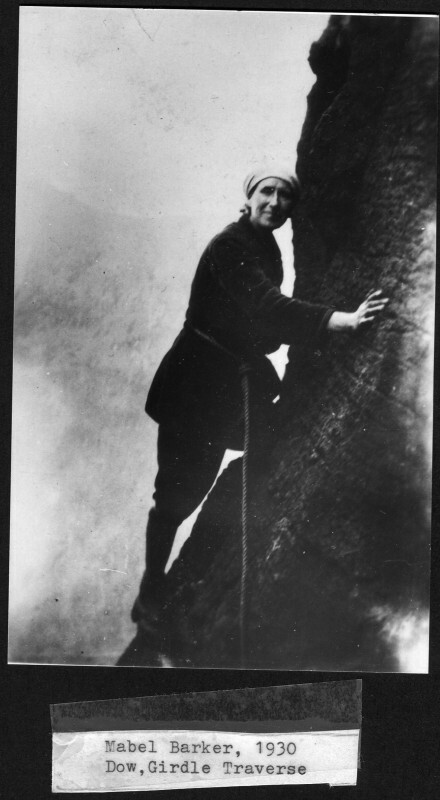 Not only a rock climber, Mabel was also a geographer and geologist and was recognised with both a B.Sc. and Litt.D.. Born in 1886 in Silloth, Cumbria Mabel was educated far beyond the usual level for a woman at the time, gaining a diploma in Geography at Oxford University and a B.Sc. in Geology in London. After the First World War, Mabel studied in France at the University of Montpellier where she was inspired by the work of Sir Patrick Geddes, biologist, sociologist and town planner. During her time at Montpellier, Mabel wrote a PhD thesis entitled ‘L’Utilisation du Milieu Géographique pour l’Education’ (The Use of the Geographical Environment for Education). Mabel was passionate about promoting outdoor education and opened a private school at Friar Row in Caldbeck in 1927. Here she encouraged children to explore the woods nearby and learn about the environment which they lived in. She would also take the children on adventurous hill walks in the Lake District with trips to Scafell and Great Gable. Mabel always taught her pupils to look after the countryside and leave no trace behind. The school unfortunately closed when the Second World War broke out; Mabel had many students from Europe attending the school and they had to return home before the borders closed. During both World Wars Mabel temporarily left teaching behind to nurse. She assisted the Society of Friends (Quakers) with refugees in Holland during the First World War and nursed at Garlands Hospital in Carlisle during the Second World War. Mabel Barker remains an inspiring figure in mountaineering to this day. As Jack Carswell’s testimonial makes clear, Mabel was known amongst her friends in the Fell and Rock Climbing Club as a superb climber and exceeded the abilities of many male climbers of the day. Mabel continued to climb until ill health no longer permitted her to do so (she began to suffer from arthritis during World War Two). Yet her successful climbing career saw Mabel Barker become the first woman to traverse the Cuillin Ridge in 1925 and - at the age of 50 - the first woman to descend Central Buttress. She died in 1961 at the age of 75 and has left behind an extensive legacy amongst the Lakeland fells. In our archive at Mountain Heritage Trust we have Mabel’s nailed climbing boots and rope used during the 1920s-1930s before the invention of climbing shoes. Our library also holds a copy of Jan Levi’s biographical book And nobody woke up dead: The life and times of Mabel Barker.